One of my favorite places to photograph butterflies. Camera equipment; Canon 40D, with a pair of flexible gooseneck flashes attached to the camera. Exposure was done manually since the flash was not TTL matched to Canon camera. I would usually shoot f16 and 1/60 sec. The proper exposure was obtained by moving the camera further or closer to the subject. On my screen the image is very noisy, have you tried reducing the noise in LR or other similar software? Nick, I share your fascination with butterflies. I've taken hundreds of photographs and, as Barbara mentioned, I struggle with ways to make them different. I find your image very appealing. The sharpness of the butterfly is excellent and the composition is outstanding. 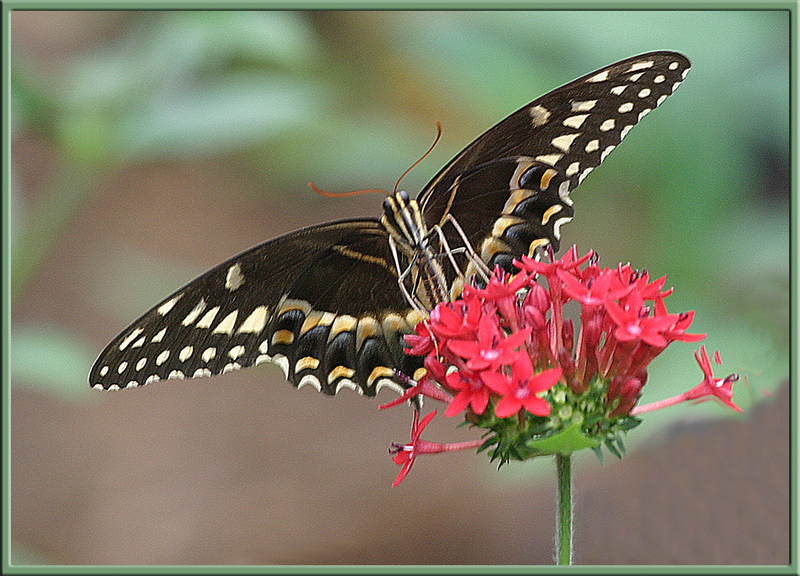 I also find that the colors of the butterfly, the flower and the flower's stem work well together. Nicely done. Like Terri, I find the background fairly noisy and would also like to see the background less prevalent. Perhaps darkening it and desaturating it a bit would keep it from being distracting.